Joseph Sheridan Le Fanu was born in Dublin in 1814, the grandnephew of playwright, Richard Brinsley Sheridan. He attended law school but decided to take up journalism instead of practicing. He owned several newspapers for a time and often contributed stories to Dublin University Magazine, of which he eventually took charge. After his wife Susanna died he became a virtual recluse, devoting himself to writing full time. He’s probably best known for his vampire story “Carmilla”, which has been credited as an inspiration for Bram Stoker’s DRACULA. Le Fanu’s impact on modern horror has been extensive. Renown ghost story master M.R. James sited Le Fanu as a major influence. Le Fanu died in Dublin on February 7, 1873. 1. “Schalken the Painter” (1851) – A young, poor painter named Schalken is in love with the daughter of his mentor. His dreams of marrying her are crushed when her father gives her hand to a hideous old man, named Minheer Vanderhausen because he can give her unimaginable wealth. The vile man takes her away with him. Minheer seems to be something inhuman, and perhaps a demon. 3. “The Dream” (1838) – A clergyman relates the strange events of his interactions with a local drunkard who had a horrible dream of falling through the floorboards of his house and landing in Hell. Once there he’s given a chance to leave and return to his life for one year if he promises to return when that time is up. He spends that year trying to change his life and avoid the fate. 4. “The Mysterious Lodger” (1850) – A man who’s lost his belief in God, gets offered an absurdly large sum of money to rent a spare room in his house for several months. He gladly accepts despite the man’s strange eccentricities. The renter keeps his face covered and is very peculiar regarding the hours he spends in his room, eating requirement’s, etc. He’s also quick to anger if disturbed. His presence in the house causes unrest as the man’s wife and children grow ill and disturbed after extended contact with him. There’s also a disheveled, menacing cat that lurks near the man. This story is filled with strange mysteries and a pervading dread attached to the mysterious lodger, who refuses to leave when requested. It’s a dark novella with spiritual morality at its core. 5. “An Account of Some Strange Disturbances in Aungier Street” (1853) – Two men stay in a house that’s inhabited by the malicious spirit of a hanged judge. The ghost has caused several deaths over the years. In a peculiar dream sequence, one of the men sees the portrait of a sinister man fly up to his window to stay there staring at him. 6. “Narrative of a Ghost of a Hand” (1863) – A spectral hand keeps trying to gain entry into a house. 7. “The Child that Went with the Fairies” (1870) – Children playing outside encounter a regal carriage pulled by four horses. Diminutive men dressed in royal décor attended the carriage, and two women are seated within, one a blond beauty, the other dark and mysterious. 8. 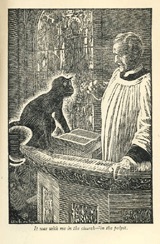 “The White Cat of Drumgunniol” (1870) – This short story includes a cat that’s a death omen, a vindictive female ghost, and a corpse that rises during its wake to stretch its arms impossibly long to try and grasp people by their feet. 10. “Green Tea” (1869) – Dr. Martin Hesselius (a character Le Fanu used multiple times) investigates the plight of a clergyman haunted by a demonic, ethereal monkey that’s trying to make him kill himself. Schalken is briefly referenced in this tale. “Carmilla” gets reprinted so often I’ve lost track of how many anthologies I found it in, but of your list, I’ve only come across “Shalken the Painter” and “The Dream” more than once. Time I got a collection of his work instead of checking anthologies. Le Fanu is great. I’d say “Shalken the Painter” is my personal favorite story by him, but there are still several out there that I haven’t read yet. No less than then great M.R. James sited Le Fanu as a big influence on him. I think, and correct me if I’m wrong, but Le Fanu doesn’t enjoy the name recognition he probably should these days. I think part of the problem is that he’s often cited as an influence on Dracula, and in people’s mind’s that minimizes the work as inferior to Stoker. And having read some (but not all) of Stoker’s non-Dracula work, I’d say Le Fanu is far better. Le Fanu isn’t remembered as well as Stoker for sure, but he’s still well-regarded in horror literature circles. To me, he’s one of the all-time greats. I really like Le Fanu. His novel Uncle Silas is a cracking gothic romp and well worth a read, if you haven’t already. I haven’t read Uncle Silas yet. I’ll have to put that on my Too Be Read list.